Pandemic patterns: Is the influenza pandemic going away? I don’t have the original data that were used to make the 1918 data1 (black traces; these are mortality data, rather than cases; some sources suggest that this would underestimate the case number for the spring/summer peak of 1918, if the virus increased its virulence before the fall outbreak) , but I think I have the chart aligned with the CDC’s weeklies (red) for this year’s pandemic. 2 They’re not identical, but they’re similar so far. In particular, there was a surge in the summer, a big peak early in the fall — much earlier than standard seasonal influenza, which doesn’t usually get going until January or February — and then the fall cases dropped dramatically. 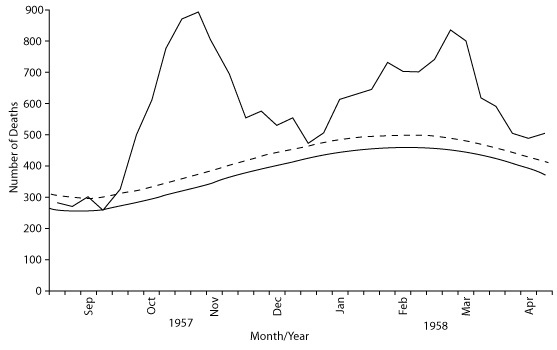 The 1918 influenza was followed by a third, smaller, peak, in winter, around the usual period for influenza. 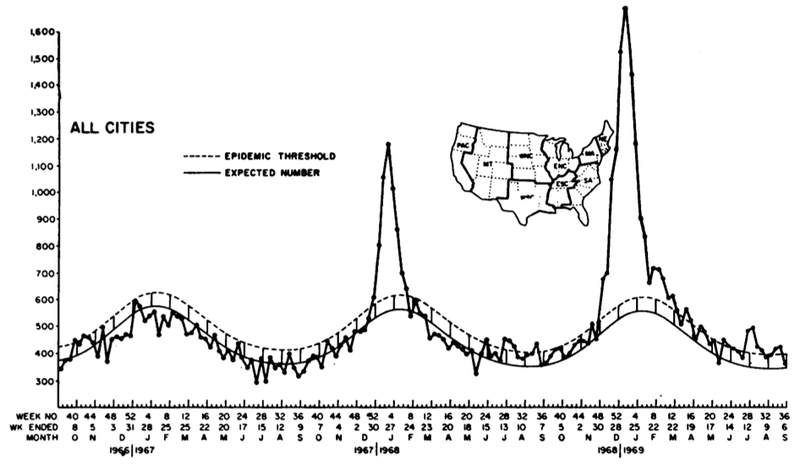 In 1957, when a new pandemic influenza struck the US, the pattern of three waves — smallish in summer, very large in fall, followed by a slightly smaller but still major wave in early winter — was also broadly similar.3 Again, there was a spring/summer wave throughout the US, starting in June and peaking, maybe, in August.4 The fall outbreak started in September and peaked in late October, there was a lull, and then there was a new surge early in 1958, this time perhaps peaking a little later in the winter than the 1918 version. The next pandemic was 1977-1978, when H1N1 returned. I don’t think we have good data for that, because the main measure was death, and that pandemic strain didn’t impact mortality significantly. 8 ,9 However, as far as I can tell, that was mainly a winter-only wave. So the common claim that pandemics come in several waves is not universally true — just two of the four 20th century pandemics acted that way — but it does seem to be true for the 2009 pandemic. In any case, based on previous pandemic patterns where the disease started this early, I’m guessing that we’re already past the very worst of the 2009 SOIV outbreak, and we’re going to enter a bit of a pause; but it’s going to come back early in 2010 — perhaps not to the same levels as we’ve been seeing in late October/early November, but not too far off. I don’t understand my kids either! !